Pretty amazing, eh? 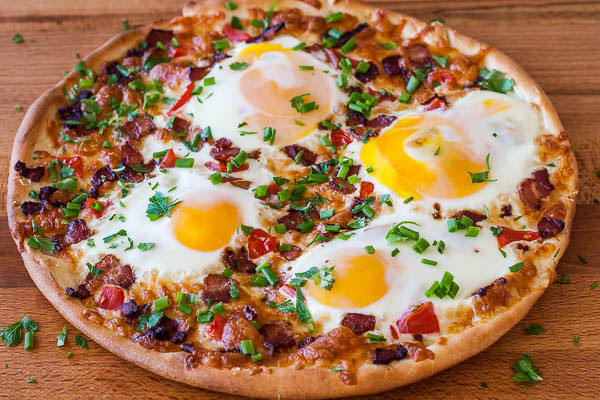 I mean I love pizza but I never thought of making it into a breakfast dish before. 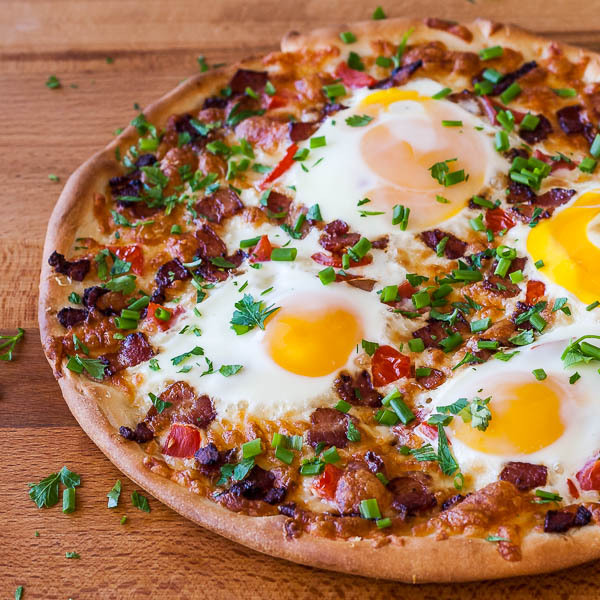 The addition of eggs on top of all ingredients really made sense, think bacon and eggs on a slice of pizza crust. Add some mozzarella, because I really like my cheese in the morning, and you are set. Now to get things rolling, you need to make your pizza dough first, which you can buy pre-made or you can use my easy pizza dough recipe for a total homemade experience (I sound like a commercial). Pizza doesn’t really have predetermined quantities so you can use ingredients as much as you like and as many as you want, your choice. If you decided making my dough recipe, I only used a third of it, the rest went into my fridge, so this recipe is for a medium size pizza. From here now… easy steps. 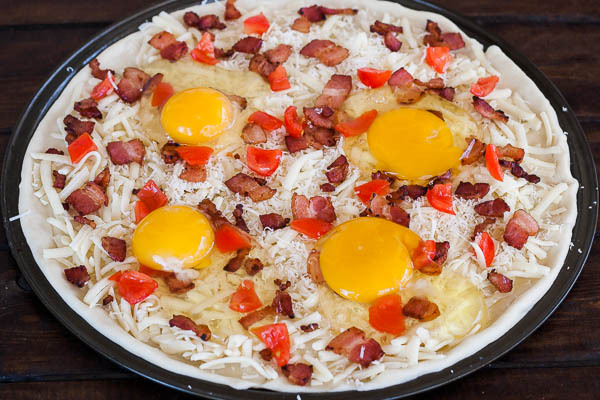 Roll out the dough, spread the cheese, add bacon and tomatoes and crack four eggs over the whole thing ( I tried with quail eggs too and while it was extremely good, it wasn’t picture worthy). Get baking on very high heat for 10 minutes ( my oven goes up to 525° F / 275° C). Enjoy! Spray the pizza baking dish with cooking spray. Roll out the pizza dough and place it on the pizza baking dish. Arrange the mozzarella cheese evenly over the dough. Add the Parmesan cheese. Add the bacon and tomatoes to the pizza, making sure they're spread evenly over the pizza. Crack 4 eggs on the pizza and bake for 10 minutes. Garnish with chives and parsley.